This contactor has 2 poles for switching both sides of a single phase load. All connections are quick connect lug style terminals. We include 8 crimp type connectors for the terminals. Six are needed and we supply two spares. These connectors will crimp onto 18-AWG, 16-AWG, or 14-AWG stranded wire. The contactor is mounted by two screw holes in its base. The distance between the holes is 60 MM. This contactor is rated to switch motor loads of up to 20 amperes at 120 VAC or 240 VAC. It is not designed to switch DC powered loads, but it can switch the AC input to spindle drives that power DC motors. This is useful to provide fail save start/stop capability for small machines with DC spindle motors. The PMDX-ContactorMD20-120 is activated by a coil that requires 120 VAC at 25 mA or less. This contactor may be directly operated by switching 120 VAC through the RUN and COM output terminals of PMDX spindle controllers including the PMDX-106, PMDX-107, and PMDX-407. 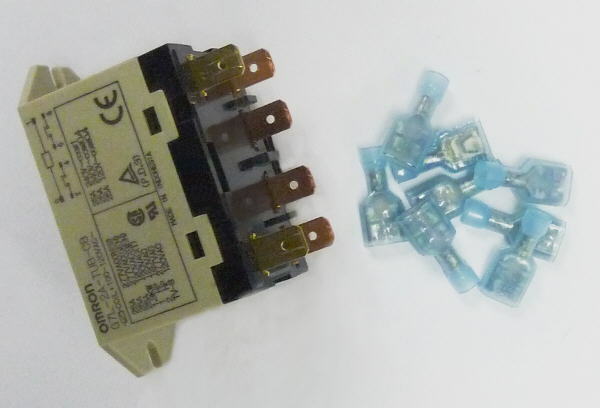 We also offer three phase contactors. See our offerings HERE.